The Commonwealth Fund has produced a map and a study (aptly entitled “Oceans Apart”) that make the impact of the ACA on women visually apparent at a glance. According to the Commonwealth Fund, 35.4 million American women between the ages of 19 and 64 were either uninsured or severely underinsured in 2010. Indeed, the number of uncovered women has increased by 6 million (17%) in the last decade, mostly due to lay-offs of teachers, nurses and other federally funded jobs that are both primarily occupied by women, and targets of right wing budget cuts. 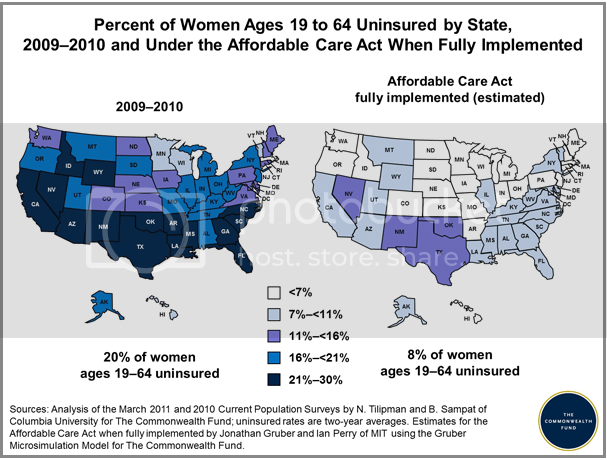 The five states with the highest rates of uninsured women were Texas (30.3%), Florida (26.2%), Arkansas (25.3%), New Mexico (25.3%), and Nevada (25.2%). The study also found that America leads the world in numbers of women who forgo health care for lack of a payment source. Forty-three percent of American women reported having skipped medical care due to cost, more than twice the number of most other industrialized nations. 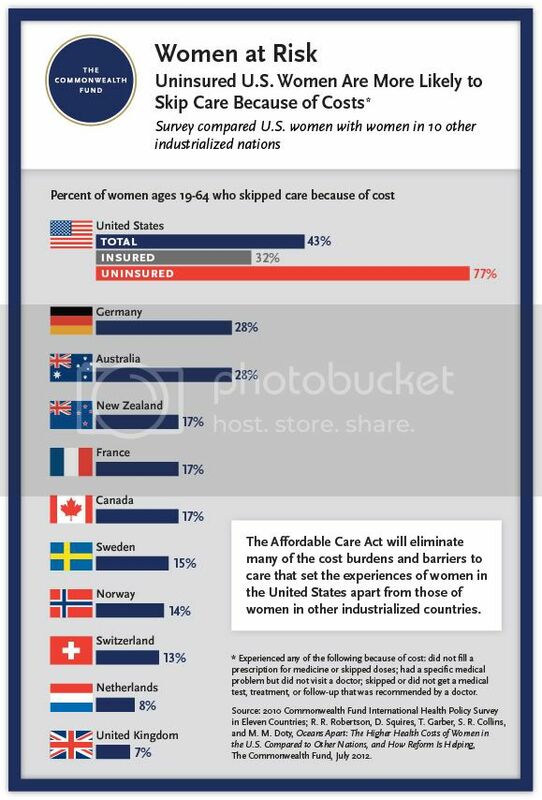 Germany and Australia reported 28% of women forgoing care due to cost, still far below American rates. Ironically, the only state to almost fully insure women prior to implementation of the ACA is Massachusetts. Which begs the question: when it comes to women, is America a third world country? Seventy-Seven percent of American women who opted to forgo care were uninsured. These are the very families that the proposed ACA Medicaid Expansion would benefit. Is it merely coincidence that the (dark blue) Commonwealth Fund states in which women are most likely to forgo care appear to be an overlay of the Jim Crow South with states that have large Hispanic populations? Or that they are agricultural states? Or that they are located in the Bible belt? The interactive map raises more questions than it answers for me. But it makes one thing very clear. Implementing the ACA and its Medicaid expansion will help lift women out of poverty. It baffles me that as the richest country in the world, we can be the last (of the first world countries) to take care of health-care needs of its peoples. Absolutely unconscious and unacceptable. We take better care of our pets and cars. The Affordable Care Act must be maintained and expanded upon to include better care for women. It is the humane thing to do.